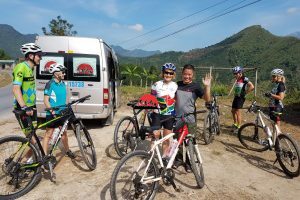 Vietnam Mountain Bike To Tribal Trails .This cycle tour through the most of Vietnam spectacular mountain range is for cyclists seeking a biking challenge, enjoy climbing and mixing it up with some off road trails. Starting in Hanoi to the scenic hill-station of Sapa ,Dong Van , Meo Vac… and ride the amazing mountain trails around Fansipan, Indochina’s highest peak, before riding over a 2 km high mountain pass, the first of many. This tour goes to a part of Vietnam where few foreigners ever venture and you’ll be amazed at the colourful clothing of the many ethnic tribes as you ride through valleys and river gorges to Dien Bien Phu. Here we’ll visit battlefields and learn how Ho Chi Minh defeated the colonial French and then two long days of riding will be rewarded by a stay at the charming Mai Chau before heading to Ha Long bay for cruising , beach relaxing and back to Hanoi. Pick up from your hotel in Hanoi at 07:30 depart for the 3-hour drive to Lang Son City, if time permits, visit the towns bustling market. From here it’s a two-hour drive to That Khe on the road to Cao Bang. After lunch, start cycling from That Khe as the road weaves and twists through the mountains. Enjoy the beautiful scenery of forested mountain ranges, lush fertile valleys and traditional minority villages. Arrive in Cao Bang in the late afternoon, if you have spare time cycle around the town. Overnight in Cao Bang. 8AM depart for Ban Gioc Waterfall; You will see perhaps some of the most beautiful scenery in Vietnam. Ban Gioc is one of the biggest and possibly the most impressive waterfalls in the country. If you wish take a swim in the cool emerald waters, see China on the other side of the riverbank and simply enjoy the pleasant surroundings. A transfer will be required to Quang Uyen. From here cycle to Trung Khanh and then onto the border with China to see the famous waterfalls. Loop back on very remote country roads toward Quang Uyen for overnight. A long but very rewarding day. 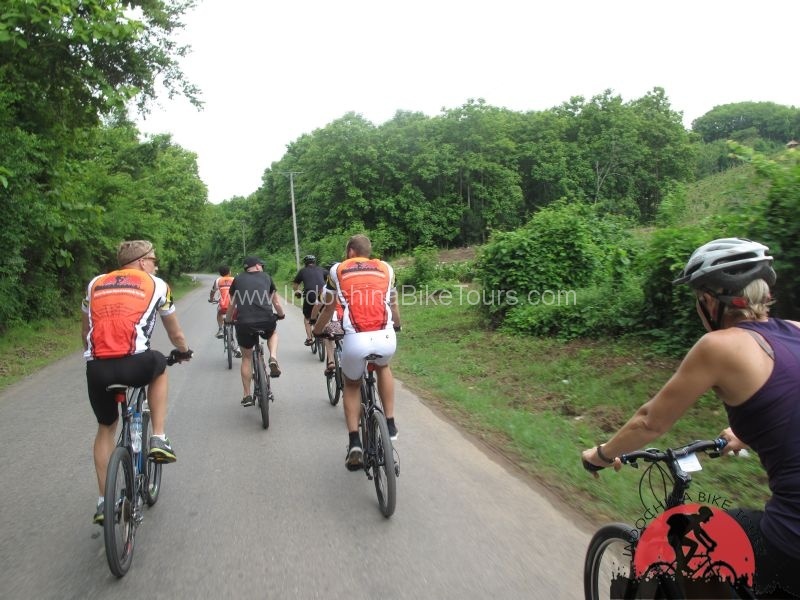 Breakfast and vehicle transfer to Tra Linh town and start cycling to the beautiful ride up & down to Pac Po cave is about 30 square metres dotted with beautiful stalactites and stalagmites. President Ho Chi Minh made a statue of Karl Marx out of one of the stalagmites, and named the spring running in front of the grotto entrance after Lenin and the highest mountain peak after Karl Marx again. In this grotto, President Ho presided over many important meetings to discuss ways to bring the Vietnamese revolution to final victory.Picnic lunch .late afternoon transfer back to Cao Bang for overnight. Beautiful ride up & down to Bao Lac Town. Few passes from where you can dominate the area. The road is easy but there are many blind curves. We can stop very often for photos. Altogether, stop for drinks and food. Stay in a hotel. Today you will enjoy a full day biking through the beautiful region along the mighty Gam River. Breakfast and start biking from your hotel. Following national road 34A for the whole morning on old tarmac which runs in parallel with Gam River eastwards for 23km Turn right at Ly Bon, cross the Gam River by newly built bridge to the northern bank and then having picnic lunch break. Afternoon cycle is challenging uphill towards Meo Vac town let near the Chinese border. The road winds its way on steep mountain sides for 50km, You may cycle as far as you can and then supporting vehicle will transfer the last portion of the road to Meo Vac.Arriving to hotel at about 16.30. Check in and free to explore the town. Option: If on the date of the Tiger or Monkey, morning will be for paying visit to Lung Phin Market, which located in a remote commune 17km from Meo Vac.Then challenging up steep mountain pass of Ma Pi Leng 28km to Dong Van Town .Check in hotel and relax for the rest of the day or walking 2 hours to explore the valley near by. Accommodation : Hoang Ngoc Hotel. Leave Dong Van at 08,30 and follow road 4C, getting though valleys after valley to Xa Phin valley. Stop for paying visit the former Palace of the Hmong King who ruled over the Hmong community and control opium trading until 1945.Continue biking along the same road 21km to Sung La valley and then up steep mountain to Pho Bang ancient trading town, enjoy several stops along the way for sightseeing and paying visiting Sung Muoi village of the Hmong. 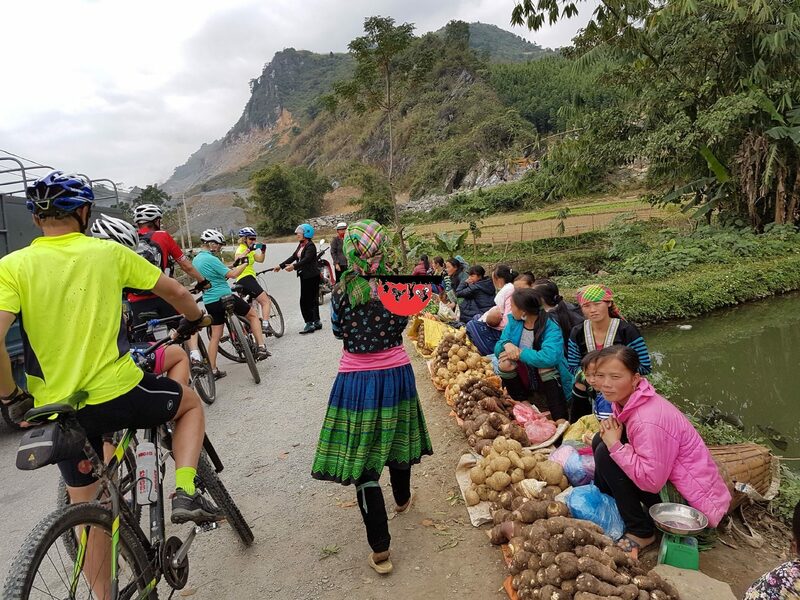 Lunch break in Pho Bang.Continue cycling downhill from Pho Bang to Yen Minh via Pho Cao Mountain pass which offers stunning scenery of Yen Minh valley. Arriving at the Thao Nguyen hotel in mid afternoon. Check in and relax. The cycle today is easy. Leave Ha Giang at 08.00 and cycle 3 km to Ban Me village of the Tay. Cycle around the valley, stop to pay visiting to homes of the Tay people. Then continuing along national road 2 on good tarmac 45km to Tan Quang junction. 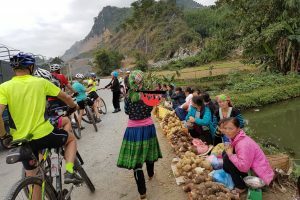 Transfer up steep mountain pass 17km to the top of Hoang Su Phi pass, enjoy picnic lunch at the top.Continue cycling along to Hoang Su Phi town. Check in and relax or take a walk to explore the village near by. Today we have free hold all day explore market if Sunday market ,Afternoon cycling or walking to visit Ban Pho villages . 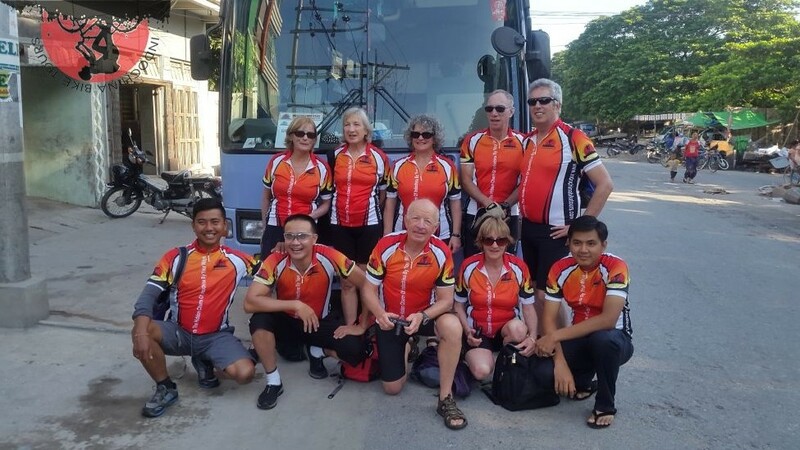 In the morning we start cycling in the surrounding area and visit a number of fairly traditional predominantly this morning will cycle up and down hill to height way 70 and then transfer to Sapa on the we will visit Ta Phin villages. Overnight in Sapa and explore dinner by your own account. Start from your hotel at 8:00 Am , bikes to explore Sa Pa an old French hill-station, in a spectacular location close to the Chinese border. 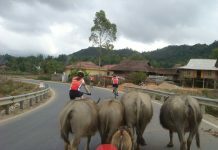 This morning we will cycling to Village , Lao Chai and Ta Van village( Red Dzao and H’mong people ) . 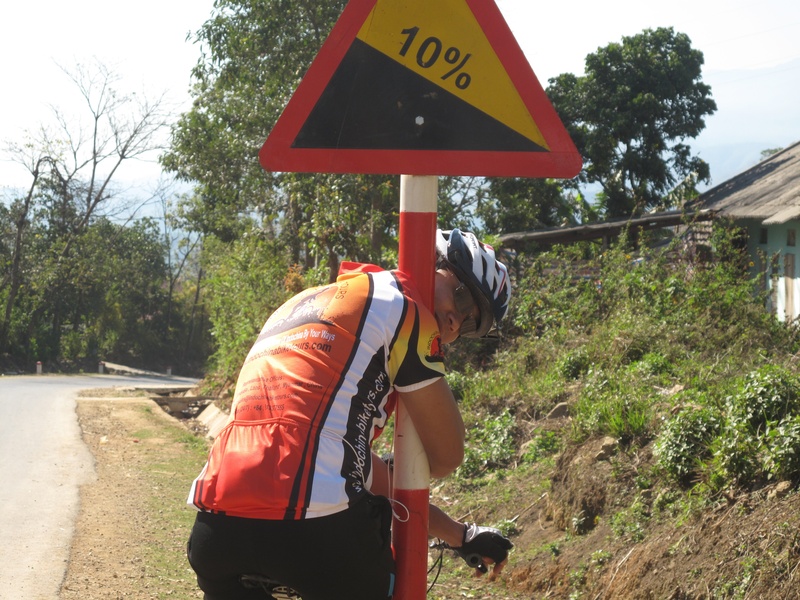 Cycle up hill back to Sapa .free explore lunch and dinner by your self. Buffet breakfast at the hotel and 8:00 AM starting from your hotel up hill to Silver water fall and cycle route back over the Tram Ton pass ( alt.+2,100 m ) to Binh Lu junction and follow the road 4D north west to Tam Duong and to Lai Chau . O / N in hotel . Our full day in Vietnam. 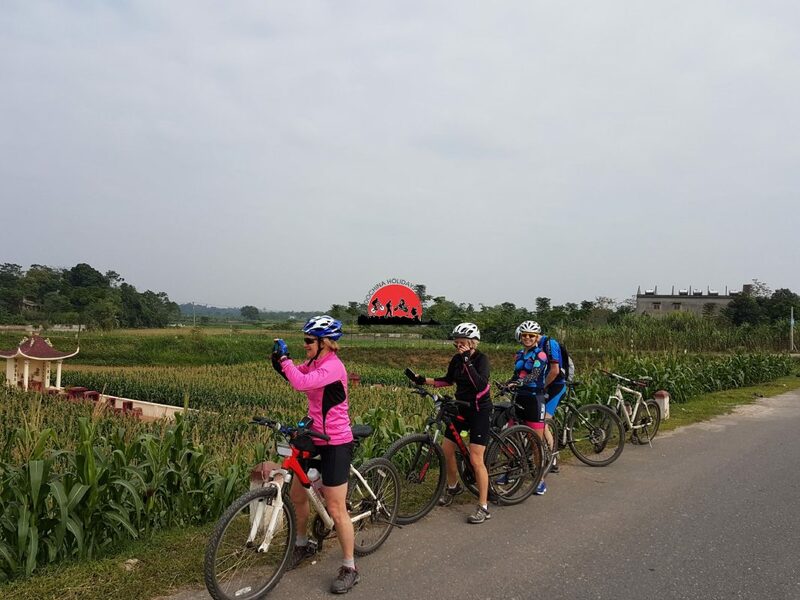 Cycle to Dien Bien Phu – 114 kms. Dien Bien Phu was the scene of the historic French defeat in 1954 ( If time permit we will visit De’Cart bunker ) Stay 1 night. O / N in Him Lam Hotel & resort . 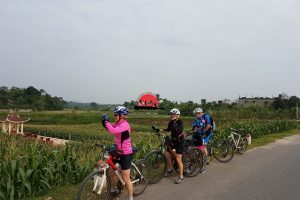 Breakfast and start cycle to Son La 160 km , along the mountain and river range culminating with the ascent of the spectacular , Lunch in Tuan Giao and transfer to the top of Pha Din pass and long down hill to Thuan Chau town for loading bike to hotel ( If time permit will visiting the old Son La prison ) . O / N in Son La . 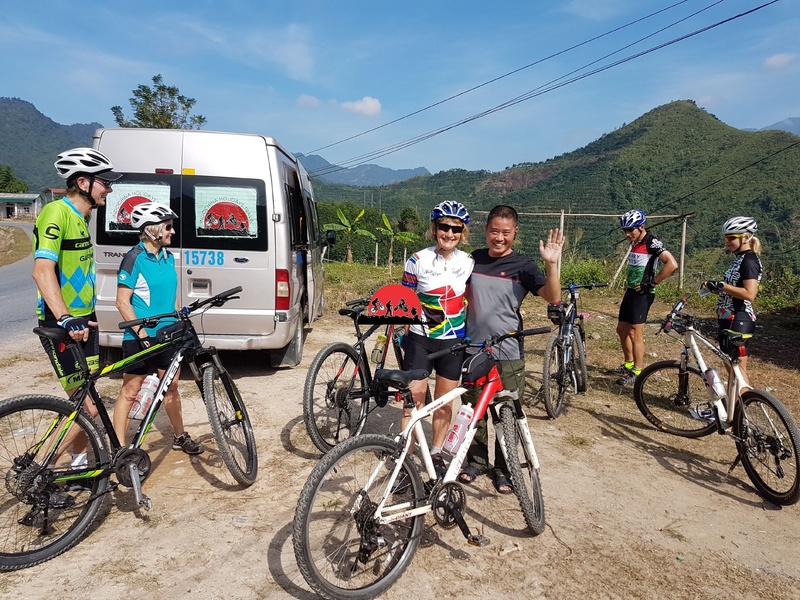 Transfer out of city and start cycle to Mai Chau village around 130 km , along the mountain range culminating ,Late arrival in Mai Chau village . Homestay in Thai people house . O / N in Mai Chau . Transfer to Cho Lo Market in Man Duc and start to pedal through the rich farming land of the Red River Delta and cycling through the breathtaking mountainous region of Thai people , Lunch in Vu Ban town and transfer to Ho Chi Minh trails to cycle to Cuc Phuong national Park . On our journey there are some opportunities to see ethnic minority people, all friendly and welcoming. Overnight in Cuc Phuong National Park -Guest House . A visit Endangered Primate Rescue Center then cycling along the forest road, riding through the jungle to gate of the national park to visit historical man cave, Lunch on the way and after lunch, continue your bike ride on hilly rural roads through countryside villages to Hoa Lu to visit Dinh and Le Temple, continue biking to Tam Coc for check in and cycling around to visit Thai Vi temple and Bich Dong pagoda, Overnight in Tam Coc hamlet . Breakfast and transfer to Ha Long bay via hight way 10 and arrival around 12:00 Our crew will welcome you on board with welcome drinks, fresh seafood lunch. You will check in your private cabins and start cruising around the bay to see the amazing karsts with different formations: Lion, Tea Pot, Toad islets……….. and then stop to visit the Sung Sot or Amazing Cave, the biggest one in Halong Bay. Later on, you’ll have a plenty of time for swimming and sunbathing. You’ll also have chance to enjoy a wonderful sunset. Following dinner, you’ll retire to the comfort of your cabins. If you like to enjoy the sunrise on Halong Bay, please get up early at 6.30. You’ll have breakfast at 7.30 when your boat starts cruising around Ha Long Bay, Lunch on boat . After that we will come back to Ha Long city before return to Ha Noi city. Arrive in Ha Noi at around 16.30, Tour Is Over At Your Hotel In Hanoi .